Hello there! Long time, no blog! I hope these last few months have been treating you well. I’ve had my head down, trying to make something happen over here, and since it’s been a while I thought you might like an update. As you may remember, I got this notion that I would make a skirt stuck in my head a while back. And that I would dye the fabric myself using an ancient Japanese technique called katazome. And that eventually I would start my own business, with this skirt being my first product. Since then, I’ve done a lot. 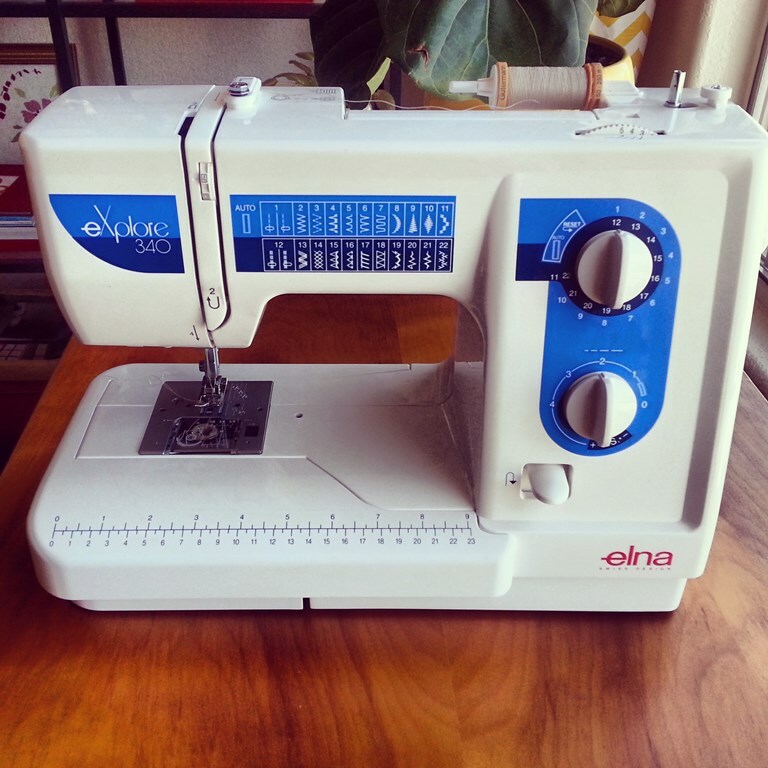 I’ve geared up (literally), buying a sewing machine . . .
And some cool tools, as you can see in the photo at the top. This time, though, I didn’t want to make the mistake that I’ve made so many times before: overbuying. So instead of going out and buying a ton of stuff at the outset, I bought each thing only when I needed it. 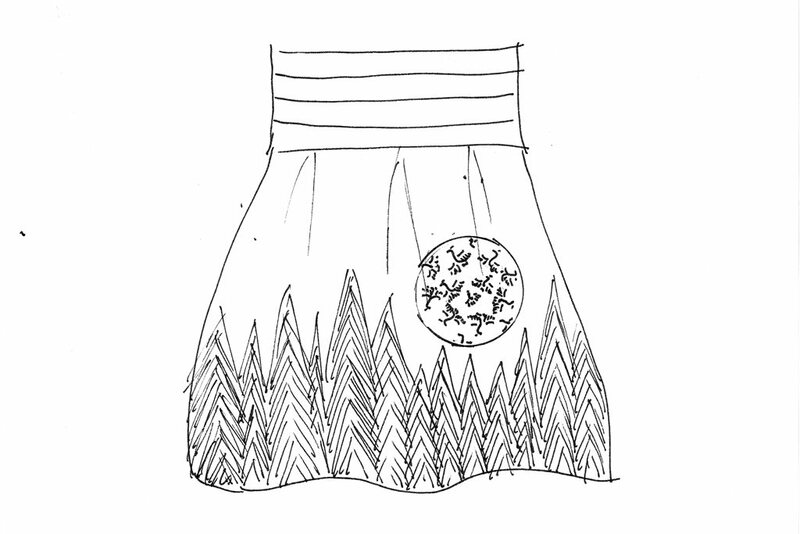 Here is a humble sketch of my skirt as I saw it in my head. I still get all excited when I see it! But after doing much reading (thank you, library!) about katazome and skirt-making and taking a few trips to the fancy fabric store, I discovered a few hitches in my plan. For one thing, fabric is crazy expensive (especially the good stuff), and skirts use a lot of fabric. And with katazome, there is a lot of stretching and leaving the fabric to dry in the sun. These large pieces of fabric started to seem impractical. So I started thinking about what sorts of products use smaller pieces of fabric. And I arrived at . . . handbags. If you know me, you’ll appreciate the deja-vu-y-ness of this. 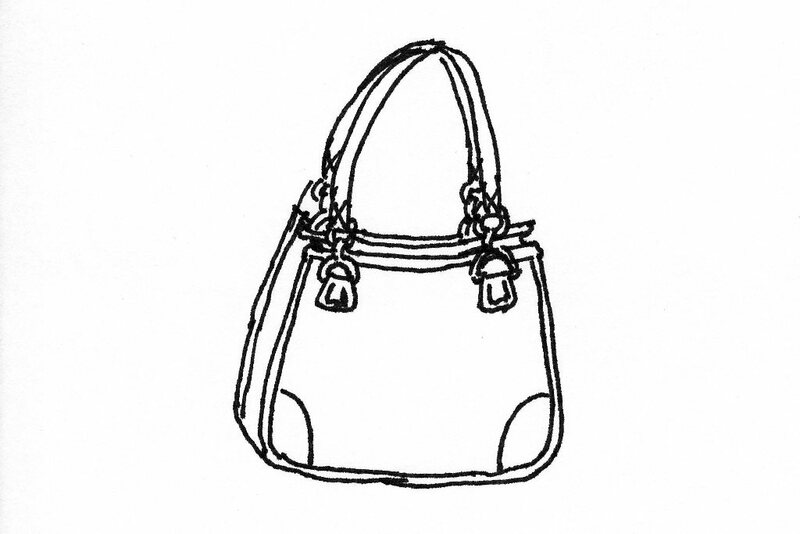 I started a handbag company a decade ago with two friends/partners. So I’m not sure—am I thinking handbags now just because I know them well and am returning to an original passion? Or is this just another stop on my creative journey? Only time will tell. But for now, the idea of bags with a feminine design but made out of a super durable, almost masculine waxed canvas fabric is really appealing to me. So that’s where I’m headed. The photo at the very top is my first attempt at pattern making. 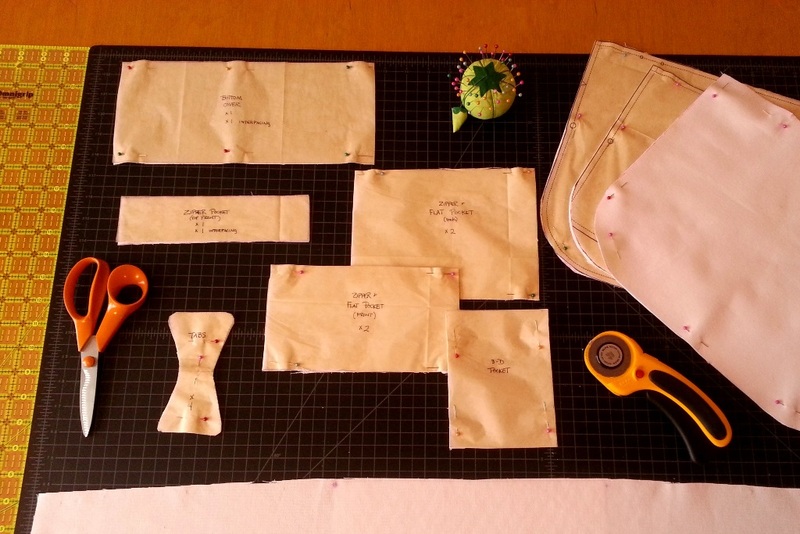 I started with a commercial pattern I bought and then cut it up and altered it until I got what I want. I’ve cut the pieces and now am awaiting the arrival of my hardware. Soon I’ll start sewing my first attempt at a prototype!!! I used to have a boss that made fun of people who, when starting a business, spent time thinking about their logo before they even had anything to sell. I appear to be one of those people—ha! I’m thinking of just sticking with my name. One good thing about having a name that is difficult to say and spell is that at least it’s unique. Initials are always a no brainer, so I have been playing around with mine. I just realized that in this version of my initials, my “A” looks a bit like the Eiffel Tower. I’ll take that connotation! This was an evolution of how I used to draw my initials, with the “A” and the “D” separated, as they are here in this rough art-deco-esque sketch. If you’re still here with me, thanks for reading all the way to the bottom. My usual tendency is to not share stuff that’s unfinished, I suppose out of fear that it’s not good enough. But what are blogs for if not to show works in progress? I’m glad I did write it all down. Seeing it all here now makes me realize how much I have accomplished, even though in terms of output, I still don’t have much to show. As they say (and I am constantly trying to get myself to remember), it’s not about the destination, it’s about the journey . . . and all the tiny steps and details that make up a process, an experience, a life. Thanks again for reading, and the best of luck with all your creative endeavors! Couldn’t leave a reply! I love your journey, Amy! Thanks for sharing!